The heart-warming story of Miss Hazel Louise. Miss Hazel Louise was brought into rescue at the age of twelve with hopes and dreams of a long and loving future. 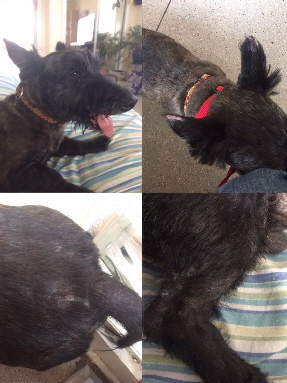 Scottish Terrier Rescue of the Southeast (STRSE) was notified by a Georgia shelter of her surrender and immediately went to her aid. She was taken to the emergency clinic due to severe urinary track infection that was causing her to urinate solid blood. Unfortunately, we learned of her grim prognosis from Dr. McCurry a few days later. After many exams, x-rays and ultrasounds she was diagnosed with advanced Transitional Cell Carcinoma (bladder cancer). The average life expectancy, with this condition, is measured in weeks or months. STRSE decided to focus on her quality of life before crossing the rainbow bridge. Miss Hazel Louise was adopted by a wonderful STRSE family, with fur-siblings, and became the queen. Cruising the town, errands with mom, snuggles on the couch and strolling in her chariot are some of her favorite pastimes. She was happy, she felt good and she had the wardrobe to prove it. Three weeks after her rescue, just two weeks after her adoption, Miss Hazel Louise crossed the rainbow bridge, peacefully. STRSE believes that all Scottie lives matter including the sick, injured, terminally ill, elderly, emotionally traumatized and all the fur-babies in between. Our mission is strong and fierce, proving that no Scottie will be left behind. Together, as a team, we are effective and are asking for your support in honor of Miss Hazel Louise. Through education, dedication and altruistic acts we can make a difference against this senselessness. Miss Hazel Louise lives on and feels no pain. Her three weeks with STRSE were only the beginning to her eternal bliss. We convey our gratitude to her adoptive family. Sadly on January 19 we said goodbye to this little lady with such a big personality. STRSE leaves no Scottie behind! Miss Hazel Louise Hill came to us three weeks prior after being dumped in an Atlanta shelter just before Christmas. Diagnosed with Bladder cancer only a few days after we rescued her we knew her time was short so we sought out to make sure that she had THE very best days left and she absolutely did! Cooked meals, stroller rides, riding in the car, power napping on the couch being snuggled and surrounded by love and kindness is how she has spent the last three weeks. Wanted. Cared for. Comforted. Loved. Happy. Her time with us may have been brief but her message is clear. Make every single day count. Love your family with all your heart. Never turn your back on those who need you. Always do your best. The heart of a dog is pure. Rest in Peace sweet girl. Run free. You are now perfect, complete, lacking in nothing. And we are so blessed to have known you. Just wanted you to know that Jock continues to be a great dog! He is doing fantastic. He has been around other dogs, at Christmas parties, on walks and in the car. 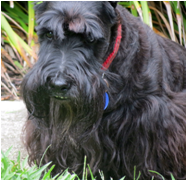 He is a great companion for us and our Scottie Maggie. She is being more active. He is a happy loving guy. He is very clever. Typical Scottie, he will steal your sandwich off the plate if you leave it there unattended. He is a great walker. Sits and stays. Working on down and we are planning to do agility in the spring. He is a busy lad on lookout, squirrel watching all afternoon. Everybody loves him. We love him! He's a perfect fit. Thank you for this special gift. Please welcome Dallas to STRSE! This little guy was rescued from a neglect situation. Dallas came to us filthy, severely matted, infested with fleas, full of hookworms and many broken teeth. His ears are raw on the tips from fly bites. We are so happy that we have him now and can go ahead with the vet care and love that he should have been getting all along. We are just so thankful that he was heartworm negative! Welcome to the good life Sir! I often say that I can’t be sure who helps who more ... me or the dogs that I foster. I think I learn just as much from them as they ever learn from me. Jonah was adopted today and is off to live happily ever after. Goodbyes are always bittersweet, to day the least. He managed to find his way to STRSE and now his journey has taken him to one of the finest families in NC that we could have ever hoped for. He had many donations to his care and many ”Get Well Soon“ cards from all over the world. It was humbling to see so many who cared so much for his well being. Everyone thrives when love is present and he is certainly a prime example of that. He is also representative of courage, strength, bravery and living peacefully in the moment. The only problem that I have had since his amputation 3 weeks ago is keeping up with him! ... and saying goodbye. Happy Tails, little one! It has truly been a pleasure. STRSE is so very fortunate to have been able to help you become one of the happiest Scotties ever. Let’s go on a rescue journey from beginning to end. This is a front row seat to what STRSE does and a look at our standard of care. It was brought to our attention by another rescue group that we have worked with in the past, that there was a young male (4 years old) Scottie in a shelter in SC. This boy had sustained a broken right front leg at some point in his life. It was never fixed or treated medically and has atrophied and drawn up and inward to the point he has no use of it. The shelter had already scheduled him for neuter surgery. They also offered to amputate his problem leg during that surgery (All for $58). The STRSE Executive Board feels like you get what you pay for and wanted a second opinion. We had our contact email the shelter and let them know that we are willing to assume all cost of his neuter and leg issues if the would release him to us for our veterinarian to give that second opinion and treat him. We are so grateful to have a very good reputation as an absolute responsible rescue. Thankfully they agreed to release him to us for his care. We were all hoping and praying that the leg could be fixed by seeing an orthopedic specialist, and that was the route we that we were willing to take. This boy is young, has a lot of life left and we owed him the best possible chance to keep his leg. To our disappointment there was no way to save the leg. This is a very hard amputation considering that it is a very old injury that has no muscle left on the shoulder or leg. It’s been a very long and expensive journey with trying to put much needed weight on him, calming his stomach and getting the GI inflammation under control, along with the anemia. We needed him to be in the best possible shape for his surgery. We slowly made our way to that goal. We currently have one of the best vets that we know amputating and seeing to it that he’s properly cared for this morning and for the days that come. We are asking for prayers, positive thoughts, and lots of love sent his way, as we have all committed to step up and see this little love through a major surgery, the stress that comes with it and his complete recovery. Upon intake on Jan 24, 2016, we decided to name him Jonah - meaning dove. The dove calls for you to gain your serenity and is a symbol of peace. Jonah is a very sweet boy and well deserving of his serenity along with a good, healthy, long life full of kindness, love and care. He has a long road to recovery ahead. This may be a setback but he has the mighty heart of a terrier and he is now stronger than ever, knows he is surrounded by love, kindness and the care that he should have received to start with. STRSE in is the process today of righting the wrongs that he has endured. He will come out of this an even stronger, even tougher, and more tenacious little Scotsman with a fierce and happy heart. Thank you in advance, Scottie family. We are a strong network and in our unity, our prayers are always heard. Sir Winston was adopted August 28!!!! This little guy has been quite the trooper. He has overcome obstacles that he came to us with. In the last two months he has lost the fleas, intestinal parasites, ear infection and a burst eardrum, eye infections, 15 teeth, his “family jewel” and Heartworm disease. 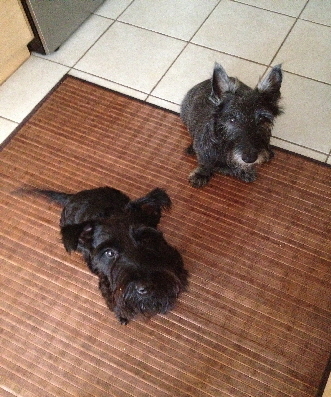 Today his life has changed forever and he has gained a wonderful new family and a 14 year old Scottie brother, Wally! He has also acquired a stunning new coat during his rescue journey!! We are so very proud and amazed with his total transformation. On June 2, 2016, STRSE received a call that a GA couple had found a stray Scottie who had been living underneath a porch for days at a nearby house. Concerned for his health and safety, they asked us if rescue could help him. 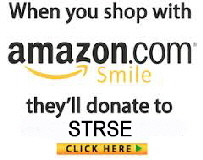 STRSE volunteers got busy making plans. We courtesy posted his picture on our Facebook page and it was shared hundreds of times in effort to try to locate his rightful owner. From what we could tell by the condition he was found in, he needed vet care ASAP. We immediately sought medical attention for him. No one ever claimed him, and there was no micro chip, but where do we start on what there was? First, he was estimated to be around 8 years old. Sadly, this sweet boy was infested with fleas and loaded with intestinal parasites. His hair was falling out. His skin was irritated and infected from the fleas. Both of his ears were terribly infected and his right eardrum had ruptured and burst. He had untreated chronic dry eye and infection in both eyes, and a mouth full of rotted, bad teeth. This should never be anyone's "normal". Faced with this mountain of issues, we picked a starting point and started to chip away at that mountain. We started with the parasites, skin, eyes, and ears. We left the vet office with 5 different meds to help get him on the road to comfort and good health. He was bathed and groomed after we left the vet, making him look as if he'd been swarmed by moths because of the hair loss. We decided to call him ”Sir Winston”. STRSE wants all of our supporters to see how your donations are spent and what a positive difference you all make for our Scotties in need. We are always so humbled by your support in helping us continue to provide such excellent medical care for our rescues. In time we had his ear infections cleared up. His eardrum completely healed and is back intact. His eyes are all healed up and the Scottie "spark" was back to stay! He will have to continue drops twice a day for the rest of his life due to dry eye, but it is manageable and he is very comfortable now. He is now flea free and Great Scot!, does his skin and coat look amazing now!! We had him neutered, microchipped, and vaccinated. He also had a much needed dental, where he did lose 15 bad/painful teeth. He has healed so very nicely. We know that he's now feeling like a million bucks! He's a very sweet spirited little guy. His newfound passion is playing with all of his new toys! Winston completed his Heartworm treatment on August 1st. He's been such a trooper and he's come so far in the months that he's been in our care. He has his last recheck appointment on August 16 to get the "all clear" from his favorite vet, Dr McCurry. We've fixed his broken wings. Soon it will be time for Sir Winston to fly. STRSE sprung this time love bug out of a shelter on July 18. It’s hard to believe that someone would neglect and dump this 3 year old boy alongside a busy in Atlanta! Alone, scared and sick, he was picked up by animal control and found himself in a high kill shelter. He had some serious skin issues going on, likely originating from fleas, and was almost bald. On July 28, Henry was diagnosed with aspiration pneumonia. We are so thankful that this didn’t present itself while this sweet boy was in the shelter, or his outcome wouldn’t have been good. Our rescues are so deserving of the very best care. So we started treatment, which included a two day stay at the emergency clinic on IV fluids and meds. While in our care, this little guy stole the hearts of everyone he met! His BIG personality came out, he was playful, loving, and had more character than most people we know! While we can never erase the past, STRSE takes great pride in giving our rescue Scotties THE BEST future anyone could ask for! On September 10, our sweet Henry started hi new happily ever after with a wonderful family and a new Scottie brother that you all may remember, Sir Winston!!! We couldn’t be more happy for both of these boys! How ironic that they both came from the same area, as strays, in similar condition and now live happy as brothers who are very well cared for and so very loved. We are honored to have had the privileged of helping both of these Scots find good health, happiness and the finest forever home! Happy Tails and much love to both of them. 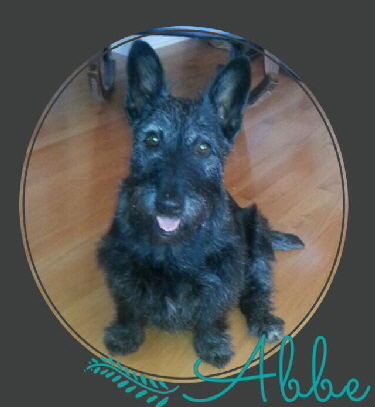 Abbe was an owner surrender to STRSE in early 2015. This sweet girl had a rocky transition before she found her current “furever home.” Her update was submitted by her new family below. Our adoption of Abbe, a 6-year-old brindle, was very sudden and fast. We received a phone call on Friday, had a home visit Saturday morning, and she was on the road from Florida by Saturday afternoon. My husband and I drove to Richmond, VA on Sunday to pick her up and take her to her new “furever home.” Best decision we could have made for her and ourselves! 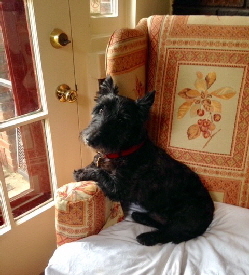 We lost our beloved adopted Scottie, Annie Rose, at the end of January - and we were feeling very lonesome. Abbe obviously needed someone to love her and boy, oh boy, is she getting just that. She is definitely a momma’s girl, but shows affection to my husband as well. When she sees me her tail starts wagging and then her whole back half just wiggles with joy. 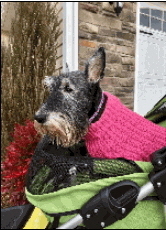 She has been so spoiled by so many people ... the women I work with even had a “puppy shower”� for us, friends bring her toys when they meet her, and we received packages from Facebook friends from the the Scottie Facebook group I belong to. Words cannot express how happy Abbe is and how happy she has made us. 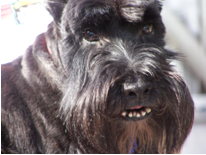 Thank you, Scottish Terrier Rescue of the Southeast. 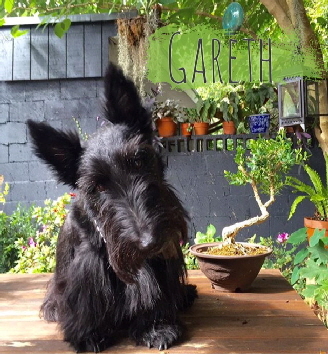 Garth was a special Scottie boy that was adopted in August, 2015 after he spent most of his life being bounced around homes and in an Asheville, NC shelter. 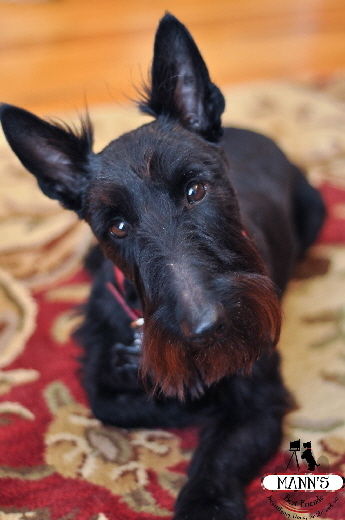 Garth now has a happy furever home in Charleston, SC where he lives with Scottie brother, Fergus! Our boy Fergus has been the light of our life since he was eight weeks old. He is (if we must say), the perfect Scottie. Yet even the most perfect dog tires of, well, perfection. While we would be imbibing evening cocktails and catching up on daily events, we would notice Fergus staring at the wall. Don't think he doesn't get any attention. En route to Alaska for a family vacation we filled out the forms on-line and when we returned, Lisa rang for a long talk about all things Scottie. She called our vet and then scheduled a home inspection with Tanya. She did mention she had a dog in mind for us. On our form we explained that we didn't care if the dog had one leg, one eye or half a tail, just as long as he could play and have fun with Fergus. Not 30 minutes after the inspection Lisa rang. Well, you passed with flying colors and I’m happy to tell you I have a Scottie with me that meets your needs! When do you want to pick him up? As excited as we were to adopt we assumed the process would take a while. Realizing we could have a little brother in a matter of days sent us into a tail spin. I guess one is never ready for ”the call” when it comes to adoption! My mama laughed as she joyously recall ironing a ball gown back in the 60s when she got the call to go pick up my sister from the hospital. The ball gown went back in the closet not to be worn for years. A week later when we happened to be driving from Flat Rock, North Carolina through Sparkle City, we made a date to pick up our little man. Lisa was nervous about his reaction to us and Fergus. As soon as we met him he curled up in my lap. The deal was sealed. We met all of Lisa’s amazing Scotties and let Fergus have a proper romp with his cousins before we departed in excitement with our new boy. Garth was originally named Max at Brother Wolf shelter but we decided to call him Garth. That’s the name of the drunk and boisterous Scottish bloke in Four Weddings and a Funeral of whom we have always been fans. The trip home was pure bliss and when Garth arrived back in Charleston he explored our home with lots of trepidation. While we toured him around, we also let him be. Through the day and the following week we would find him curled up in three different fireplaces (long since empty and clean!) and in his favorite spot, perched on top of the couch, legs akimbo, head cocked. As the weeks progressed we admit that there were some difficulties. He snapped at Paul twice, peed in the house once and attacked a poor Golden Retriever. Also, Fergus was not bonding one bit and seemed pretty irritated with him. We hired a dog trainer to get an outside opinion of the situation. This was the best thing we did. She met us out at Hampton Park and watched the dogs, gave advise about Garth’s demeanor and assured us that all dogs are pack animals and they would bond. Their bond occurred in the most amusing fashion. One day when Paul was working from home he heard an ambulance siren from afar. As it came closer he heard Gareth grumble and then chirp and then he belted out the most beautiful Arrrrroooooooooooooo! Fergus scurried out from under the coach (our trainer calls him the troll under the bridge) in disbelief. You see, sweet Fergus had never howled before. This was music to his ears and with a little encouragement from Garth, Fergus stuttered out a howl until his head tilted back, his eyes closed and he synced up with Garth's howl like a little Argyll Angel. When the ambulance passed, the boys came out of their trances and that was it. They were bonded. Since then they wake us up in the morning by tip tapping into the bedroom and stretching their paws up on the bed. Once we pick them up they shower us with kisses and snuggle together. When we take them to the park they are “the dark duo” chasing dogs and balls together. And when it’s playtime Fergus nips at Garth and they start hardy tug of wars with their favorite Harry Baker rope toy. There is no more staring at the wall during cocktail hour that is for sure. These two boys keep the living room covered with toys and now, when we hear the faint cry of an ambulance we stop everything and watch in pure proud parental glee. 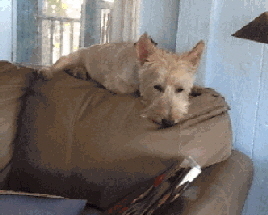 From being placed at a high kill NC shelter, to chilling on the back of the couch at his Pawleys Island Beach house, 2015 STRSE Alumn Jack is living the Scottie dream! Stories like these are a rescuers’ dream! 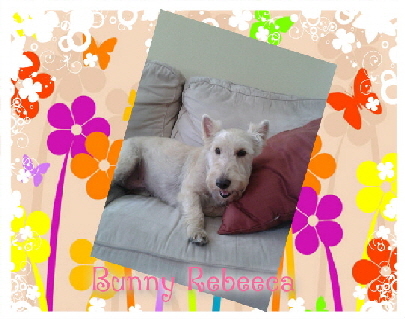 Meet Bunny Rebecca! 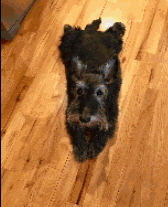 Her new parents Howard and Karen contacted us in Florida about a year ago after loosing their precious Scottie Ann. They weren’ t sure if they were ready so we put their application on hold for awhile. Well, along came Bunny who needed a new home where there were no other dogs. She was surrendered by her owner due to health reasons and had very little socialization for most of her life. She needed a new devoted family who could introduce her to a big wide world and Howard and Karen were just the ticket. They saw her pictures and heard her story and it was the perfect match at the perfect time. She has settled in just fine as you can see from her happy expression and is enjoying walks around the neighborhood, playing with toys and lots of love. Many thanks to Dawn for reaching out to her new potential family, Brenda and her family for fostering and Pam for doing the home visit at such short notice in order to make this happen so quickly for Bunny Rebecca and new furever family. Hawkhaven Highland Heart Song “Quincy” Quincy is 12.5 years old and the feisty Man of the House! This is the “tail” of an extra special little girl. Many of you know Lacy’s very tragic story, have graciously donated towards her treatments and have followed along on her journey with us. 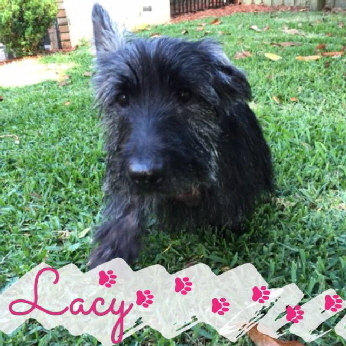 Lacy was left abandoned in a house in the fall of 2014 in Orlando, FL. She is now a Forever Foster with STRSE. You can hear more about her story and how she was found here: http://www.clickorlando.com/news/orlando-police-investigate-after-dead-dogs-found-in-home/29003620. Lacy is doing well and appears to feel great! She never acts as if she doesn’t feel good. Her hair is still a bit slow growing. She has a great appetite and is a good girl about taking her daily meds. However, she isn’t the biggest fan of the eye drops that she has to get - she runs off when she sees me coming with the bottles. She loves to run around the pool deck and despite her sight not being very good she still manages to run around the pool without any accidents. Of course we watch her like a hawk! She loves lizards and looks for them every time she goes outside. Lacy loves the bed and lies right next to me. It's always a race to see who gets to sleep next to mama but they seem to work it out throughout the night. Lacy's last appointment at AVS (Affiliated Veterinary Specialists was in February and everything was good - they were very pleased. They did tell us that she does have cancer. I have shared the rescues wishes with them - we feel that Lacy has already been through so much and that we really want her to happy during her remaining time on this earth. Her last eye appointment with the specialist went great as well! 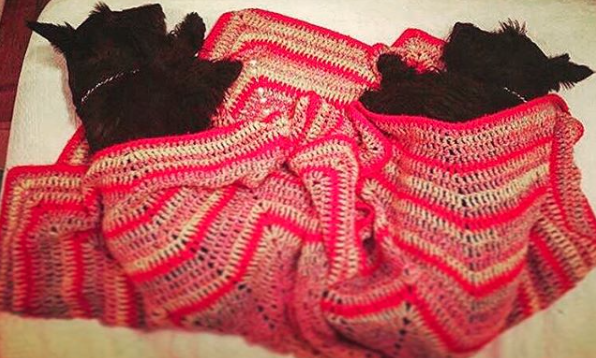 So all in all - everything is wonderful with Lacy. As I have said before, you would never know she is sick - she is a strong girl! 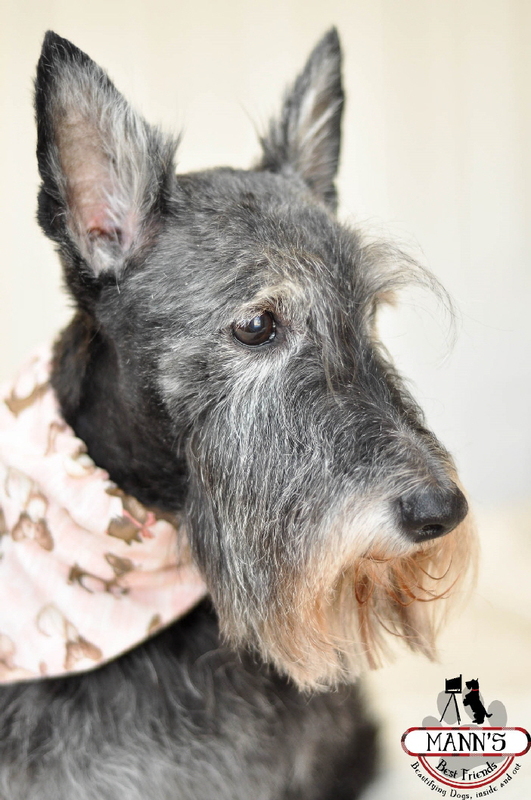 To start this happy tale about an awesome senior Scottie, let's first see his pictures. We had successfully adopted two Scotties about four years ago from the Scottish Terrier Club of Tampa Bay and have been so enamored by this breed. We volunteered to help the rescue group any way we could - especially in transporting Scotties from foster homes to the permanent adopting family. 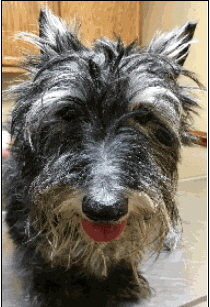 On one of these volunteer assignments we took in a cute little Scottie girl to help out until a permanent arrangement could be made. Unfortunately, this little girl didn't like other dogs at all. Our Salt and Pepper Gang became very upset and confused about why they couldn't play with her and she had to be confined to the crate. After three days it was obvious that this arrangement would not work. We contacted Janet, our rescue coordinator, who said she’d take the girl, but asked if we would mind swapping dogs, as she had had Toby for several months and really did not have room for even one more. Thus, the real story begins - we made the swap and it was true love blossoming on the ride home. Our two Scotties fell in love with him quickly as well. Kenzie considers him her “boy toy” and Dougal is glad he has some relief from Kenzie chasing him all the time. Now, you have to understand poor Toby came off the streets of Miami in really poor condition, but with all the love and attention Janet had given him and the love he gets at our home, he is really a happy, loving senior puppy. Yes, he has a rather large overbite and, yes, he has a funny, wonky walk and is now nine plus years old, but who cares. When he sees us, his little tail goes around like a helicopter's rotor blade. He gets excited and wants to play, if only for a short while. I wanted to keep him the minute I got him home, saying, “No one is going to want this older dog, with his wonky walk”, but Gary asked we wait at least a week just to make sure he would be a good addition to our “Gang.” I kept whispering to Toby, “Don’t worry; you’re ours now and no one is going to take you away.” Yeah, right; he caved in after two days with Mr. Rotor Tail! It always amazes me that so many people only want puppies, not older dogs who can give so much love and appreciation back to their new family. I got a phone call from a lady who told me she worked in rescue and had found him on Craig’s List. She called and got the people to surrender him to her and she called me. I met her at the airport and she gave him to me. He was emaciated and had not had a hair cut in a long time. Eye, ear and skin infections. He was very wild, had spent his first 15 months in a crate. He was afraid of everything, we are still working on this but he is much better. He was full of fear, it was very sad. He also had horrible separation anxiety, it was so bad he would foam at the mouth and throw himself into the front door when I left. The first week he went to my vet and they worked with him, he has gotten much better. He has now bonded with my brother so he is OK to be at home with him now and without me. It took us 4 weeks to get to this point, it was awful he was such a mess. Now he is good because he has me at night and my brother during the day, he works nights. His older brother Duncan at 8 has been very tolerant of the little terror. LOL! They play like puppies now, it’s very cute. Archie is very Alpha so it’s lucky Duncan is not. They have their moments but they go away very quickly and no blood has ever been drawn. He has gained weight and is doing much better, I love him to pieces, he makes me laugh every day. He is a very happy little guy and actually wants to please me and will lay his head on my chest or shoulder. He loves everybody now, not so much when I got him but he really is one the friendliest Scotties I have ever had. Benz (formally Cade) is living the good life with DeeDee and Rick in NC. Cade was underweight and full of fleas when our volunteers PJ and Robin picked him up and transported him to the vet. He had an ear infection and was overall not feeling very well because of his condition. He has been fully vetted, neutered and groomed. He really needed his teeth cleaned as well. And no more fleas for this boy! He has started to gain weight, his hair is coming in very well and he is one happy boy. 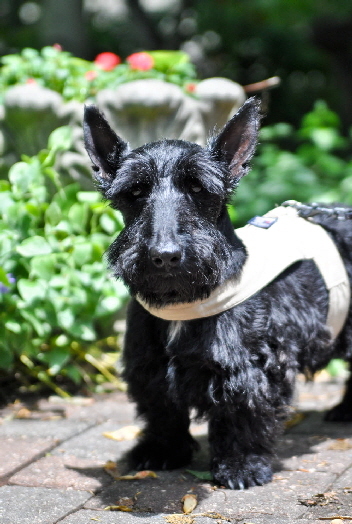 He loves his daily walks and visiting with his Scottie friends who live across the street. 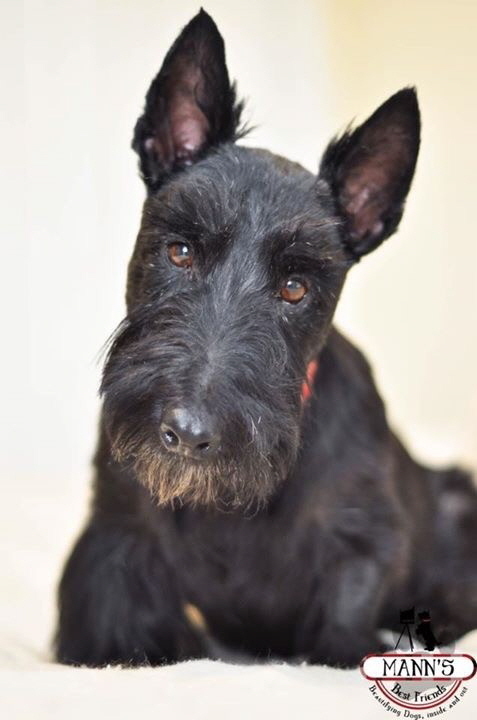 Benz is a beautiful and very sweet Scottie boy whose life will be all it’s meant to be with his new family. These are only a few of the countless stories from our rescue Scotties that have found their way into loving homes over the past few years. 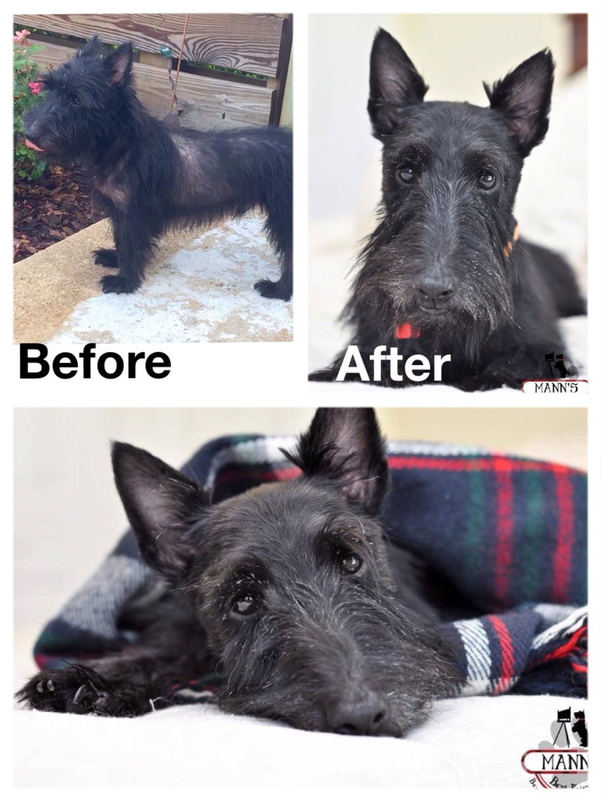 If you'd like to submit an update about your STRSE rescue Scottie, please email your update with a current photo to strse.carolina@gmail.com. Click on section divider to return to top of page. 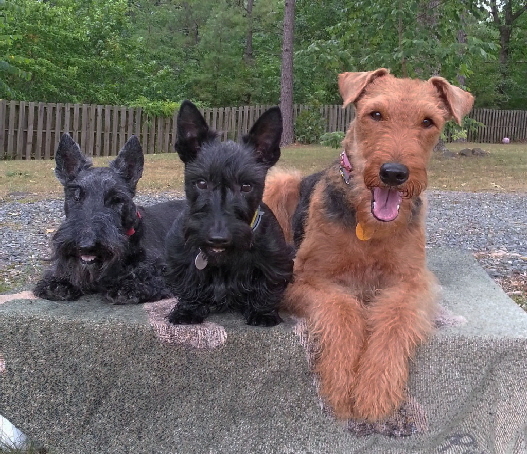 Scottish Terrier Rescue of the Southeast. Jasmine came to us as an owner surrender on July 6th. We were told that she was 8 years old and extremely healthy. After doing a little investigating we found out that she was actually 13 1/2 years old and full of cancer. After the first couple of days in our care, we were very concerned that we were facing a heartbreaking decision. Our fabulous vet, Dr Eric McCurry ask that we give her a week to see if we could come up with a plan of palliative care and pain management. On July 18th a much happier Jasmine was officially adopted by one of STRS’s finest families! Jasmine’s mom is pleased to report that she is doing beautifully in her new home. 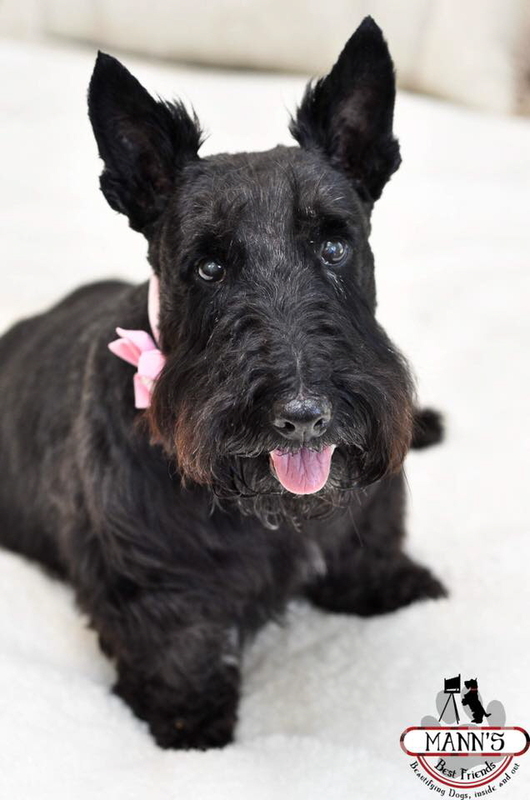 Jasmine loves her new Scottie family - Watson, Dottie and Clara. She is especially enjoying lots of bully rubs, her orthopedic dog bed, and cruising the neighborhood in her pet stroller. Thanks to her regimen of vitamins and supplements, her tumors seem to be shrinking and her mobility problems are much-improved. This formerly depressed and defeated girl’s life has completely changed. Jasmine will continue to live out her life happily as an adored and spoiled rotten family member!